Your Agency should have home health forms, policies and procedures regarding the consent and application of restraints. Restraints are methods used by trained caregivers to stop or limit a patient's movement. Restraints may be used without the patient's consent. A patient has the right to safe care and to be treated with respect. Patients have the right to help plan their care. To help with this plan, patients must learn about their health condition, how it may be treated, and when restraints may be needed. Treatment options should be discussed with caregivers. Patients and caregivers can work together to decide what care may be best. The patient may become more angry or violent while in restraints or seclusion. The patient may struggle against physical restraints. This can cause skin wounds or block blood flow. It can also increase the patient's heart rate and breathing rate. This can be life-threatening. Chemical restraints can cause low blood pressure, heart rhythm problems, and slow or shallow breathing. This can affect how much oxygen the patient gets. Chemical restraints can also cause drooling, shuffled walk, muscle spasms and stiffness, and tremors. A legal document is required that explains the tests, treatments, or procedures that the patient may need. Informed consent means the patient or guardian understands what will be done and can make decisions about what they want. The patient gives his permission when he signs the consent form. He can have someone sign this form for him if he is not able to sign it. The patient has the right to understand his medical care in words he knows. Before the patient signs the consent form, he needs to understand the risks and benefits of what will be done. Make sure all the patient's questions are answered. 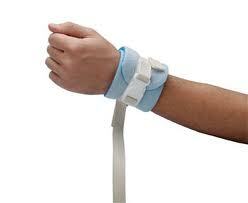 Physical restraints are devices that limit specific parts of the patient's body, such as arms or legs. Belt or vest restraints may be used to stop the patient from getting out of bed or a chair. Chemical restraints are medicines used to quickly sedate a violent patient. These will be given as a pill or an injection. Seclusion is placing the patient in a room by himself. The room is locked and kept free of items that could cause injury. Caregivers will watch him at all times. Vital signs, such as heart rate, breathing rate, and blood pressure, will be taken often to make sure they are in normal range. The patient's physical comfort will also be monitored closely. Caregivers will check the patient's skin for injury or blood flow problems under the restraints. They will also give him liquids and take him to the bathroom as needed. The patient's behavior will also be monitored. Caregivers will remove physical restraints or allow the patient to leave seclusion as soon as he is calm and cooperative. Progress E-Z is the Best, Fastest and Easiest Method for Documenting Visit Notes at the Bedside! Click here for more information!